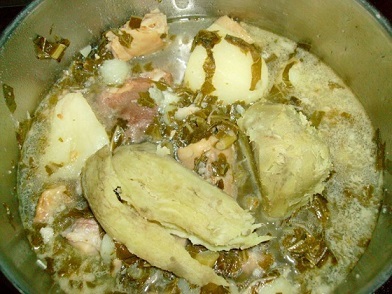 Couves de Barça is a traditional Kale and Pork Stew from the island of Corvo in the Azores. It is one of the signature Corvo recipes, and is typical because it utilizes all the parts of the pig in efficient fashion, to not waste any food. Because it combines all these parts with typical Portuguese ingredients like kale and garlic, it yields a wonderful and flavorful broth perfect for cooking tender pork meat and dipping with Portuguese bread, Pão de Milho. 1) First cook all the pork parts and tenderloin in a saucepan with water for 10 minutes on medium heat. 2) Remove the water from the pan, and add it to another saucepan. 3) Bring the broth in this saucepan to a boil, and add the pork, chopped kale, and potatoes. 4) Add the pork lard and salt to taste. 5) Cook for 30-40 minutes on medium heat until the pork and potatoes are done. 6) Pour into bowls and serve with Pão de Milho, or Portuguese corn bread. If you don’t have Pão de Milho, use regular toasted bread.